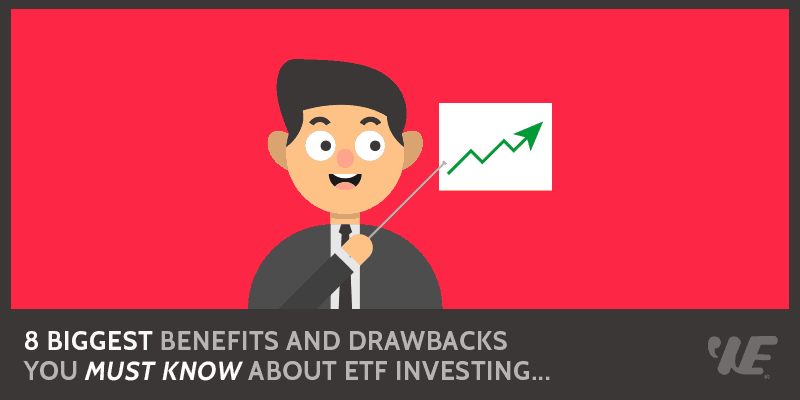 8 Biggest Benefits and Drawbacks of ETF Investing | Wealthy Education - Investing Strategies That Work! Exchange Traded Funds (ETFs) have become a very popular investment vehicle for large and small investors alike. This is primarily due to the fact that they combine the outstanding diversification of a fund, with the convenience of trading a stock. But like every other type of investment, ETFs have their inherent downside, and should be approached from a well-informed vantage point. To help develop your knowledge base, let’s examine both the advantages and disadvantages of ETF investing. Spreading your assets over a broad range of securities is an effective way of improving your potential investment returns, and ETFs are a great vehicle for accomplishing this. As collections of stocks or bonds representing a wide variety of both regional and international markets and sectors, ETFs offer hundreds of opportunities to track and mimic the returns of everything from the S&P 500, to the biotech industry, and from short-term bonds, to the emerging market of a specific country. With ETFs, you can easily develop an investment style that suits your preference, and that allows you to create a portfolio based on growth, income, and long-term stability. One of the biggest advantages of ETFs is that they can be quickly and conveniently bought and sold on the stock market, at any time during the trading day. This allows you to follow the current and daily pricing of any ETF, as well as the trends of the market or sector it tracks, by simply looking up its assigned ticker symbol on any stock market website. And unlike mutual funds, that must be purchased after the market has closed and their net asset value has been recalculated, ETFs are highly liquid and allow you to remain responsive to the market in real time. When it comes time to invest your hard-earned dollars, the relative savings offered by ETFs cannot be ignored. Because they are more passively managed than mutual funds, Exchange Traded Funds have much lower management fees and, subsequently, much lower expense ratios. ETFs allow you to forgo paying for active management techniques that, more often than not, fail to result in beating the market. As long as you look for low or no-commission brokerage companies and ETF providers, invest in relatively large increments, or adopt a philosophy of buying and holding, ETFs will cost you a lot less than other managed index funds. Because they are designed to track the performance of a specific market index, rather than to beat the market they represent, the equities held by ETFs are not constantly being bought and sold like those of many mutual funds. Every time a security is sold for profit by a mutual fund, the resulting capital gain is distributed to its shareholders, meaning they must pay the relevant tax on this income. ETFs offer a unique tracking investment structure that allows for in-kind share transfers and redemptions that do not result in capital gains tax having to be paid. This simply means you can defer most tax implications until you sell your ETFs, making them far more tax-efficient than mutual funds. Although their management fees and expense ratios are far more favorable than most mutual funds, ETFs do incur a commission charge every time they are bought or sold. This makes them more expensive than trading individual stocks, since stocks do not have management fees. If you are a frequent trader, these commission fees can add up, reducing your investment returns, and undoing the benefits offered by the ETF’s built-in cost advantage over more actively managed funds. This is particularly true in the case of no-load mutual funds, which do not charge a commission when they are sold. It’s important to compare all the fees associated with similar funds, including trading fees, and to recognize that ETFs lend themselves far more effectively to lump sum purchases and long-term holdings. The term tracking error refers to circumstances where an ETF’s management company does not keep the fund’s holdings fully in line with the performance of the index it’s supposed to be tracking. This margin of error is unavoidable to some extent and is usually a cash allocation problem, since not all of an ETF’s financial assets are fully invested in shares at any given point in time. Part of an ETF’s assets are always held in cash to pay for various administrative fees and expenses, and the lag time between declaring and paying or reinvesting the dividends earned by certain types of ETFs means they will never track their intended indexes with exact precision. Sometimes ETF managers simply don’t have access to the shares of illiquid securities held by their funds and, in order to re-balance their index holdings, they must resort to buying shares in similar securities instead. All of these factors can cause the performance of an ETF to deviate from its intended benchmark to varying degrees, and can result in a cost that’s inevitably passed along to the investor. It’s important to be aware that some types of ETFs do distribute capital gains to shareholders, as they’re earned, forcing you to pay the relevant tax amount on that gain. This is not generally an ideal situation for the investor, since it’s often more beneficial to defer taxes by automatically reinvesting any capital gains. To accomplish this goal with ETFs of this sort, you would have to use any distributed gains to purchase additional ETF shares yourself, resulting in more fees on top of the unwanted tax implications. Over the years, new ETFs coming on the market have gradually begun to exhibit higher management and administrative fees, so it’s vital that you carefully examine and compare the expense ratios of the various index funds on offer. Most commonly, this fee creep has been attributed to increasing fund competition, marketing expenses, and index licensing costs. In considering the pros and cons of ETF investing, the bottom line is that they are well worth considering as a valuable addition to your long-term investment portfolio. As long as you do your homework, and keep their potential costs and tax implications in mind, Exchange Traded Funds offer the opportunity for unbeatable asset exposure, diversity, convenience, and relative stability within the parameters of stock market investing.